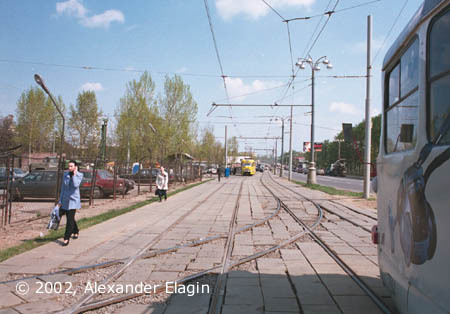 The tram line along Akademika Korolyova street was closed from February 2002 to October 2002. 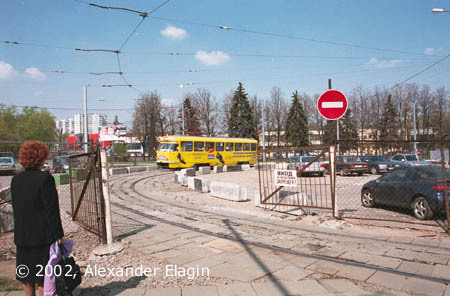 The terminus that could be used for routes 11 and 17 (VDNKh South) was lifted in 1997 but the service on those routes could not be interrupted, and the new temporary reversing loop named 1st Ostankinskaya Ulitsa was constructed near the crossing of the tram line with that street. The loop occupied a part of the parking lot, and this very fact is almost unique. I can remind dozens of cases when tram surrendered to cars, but hardly otherwise. All construction works have already been completed by the last day of January, including the overhead. The last preparations are on the way. It was very cold those days but the weather could not hinder the construction. Three months later. A yellow Tatra is reversing in the loop. Note that the track is segregated from a parking lot with concrete slabs. And here you can see how the loop track re-joins the main line. The tramcar throwing a shadow where I am standing taking photos is located on a stub track. 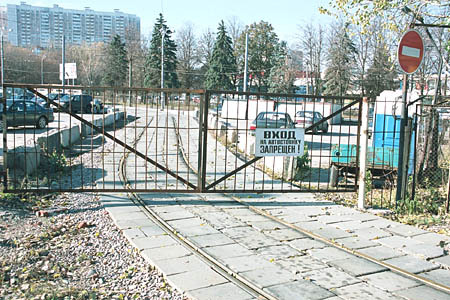 The stub tracks being the part of the temporary closed main line would be used as a storage for service trams. One of those cars was used as a control room for routes 11 and 17. 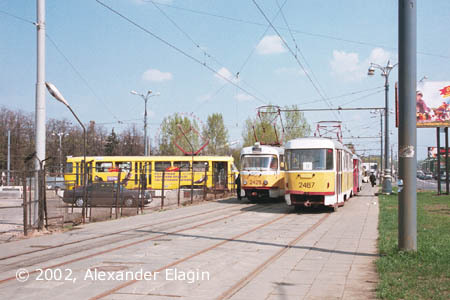 Note the tram in a yellow advertising livery on a reversing loop. 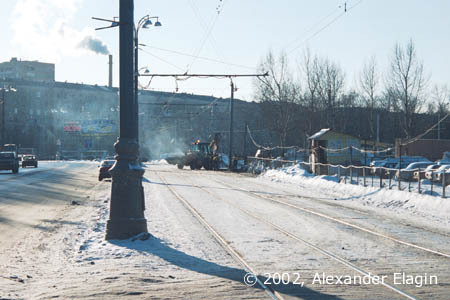 On October 15, 2002 the regular service along Akademika Korolyova Street was resumed, and the temporary loop got unused. 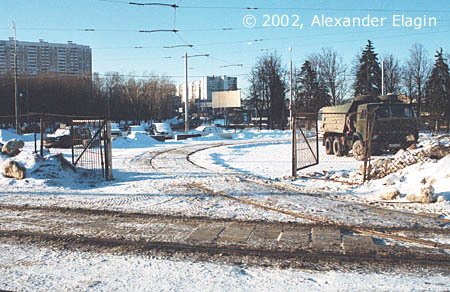 The gates were barred, and in a few months the catenary was removed. A year later the tracks were also lifted and today the spot looks almost the same way as before the loop construction, the only difference being monorail beams hanging above the parking lot.